The caffeine comes from the coffee bean from which coffee is brewed. Each kind of coffee bean has a different amount of caffeine in it. Normally a darker roast coffee has less caffeine than lighter roast. This is because the roasting process destroys some of the caffeine. 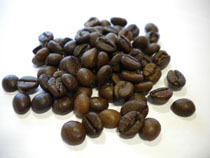 The Robusta coffee bean contains more caffeine than Arabica coffee bean variety. On average, a cup of filter or drip coffee contains about 100mg of caffeine which if consumed every day is enough to lead to withdrawal symptoms such as headache, fatigue, drowsiness and difficulty concentrating when you stop. Decaf coffee still contains small amounts of caffeine – a small cup of decaf contains 0.3mg of caffeine, which is considerably less then regular coffee. It is important to remember that decaf coffee is not caffeine free coffee and drinking many cups of decaf coffee a day would have the same effect as drinking one or two cups of regular coffee. If you are interested in learning about the various methods of decaffeination, please click on this link. It is interesting to note that the amount of caffeine in tea varies considerably. The length of infusion – the longer the tea brews, the more caffeine it will contain. Fermentation time – the longer the leaves are fermented, the greater their caffeine content. 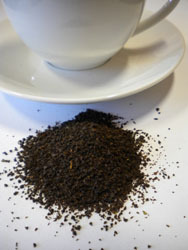 Location of leaves – the first and second leaves of the tea plant contain the most caffeine. The courseness of the leaves – tea bags with broken smaller leaves produce an infusion with more caffeine then loose tea with bigger leaves does. I do hope you found this information about the caffeine content in coffee and tea interesting and helpul in your quest for good health. If you have any questions or comments, please contact me as I would love to hear from you.